An exciting new fundraising initiative starts this October when, for six months, localgiving.com will be doubling all online donations – up to a maximum of £10 – made to Kernos and other member charities! This fundraising campaign starts on Tuesday 14th October at 10am after which all your one-time or monthly contributions, made to us at http://localgiving.com/charity/kernoscentre, will be matched pound-for-pound up to £10, or up to £10 per month, for 6 months. 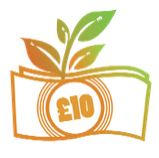 And, if you are a UK taxpayer and Gift Aid your contribution, a one-time donation of £10 made during the Grow Your Tenner campaign could generate £21.55 for Kernos. As a Local Giving active charity member, Kernos is eligible to receive matched funding of up to £12,000 from this initiative, which is running across the whole of the UK. All that’s needed for us to hit this target is for 100 kind people to donate just £10 each month for the duration of the campaign. So let’s get donating so we can start growing those tenners – it’s all in a very worthwhile cause!